30 minutes west of Edmonton on Hwy 16 or 4 km west of Hwy 43 on Hwy 16. A large stone sign complete with waterfall, marks the entrance to the course. 1 km signs both east and west warn of the entrance to come. 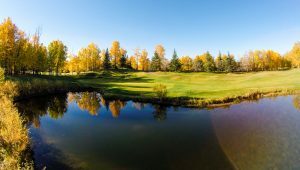 Cougar Creek Golf Resort is one of Alberta’s finest championship courses that showcase Alberta’s natural beauty. Course designer Bill Robinson, of Oregon, took advantage of the natural forest and rolling terrain of the region to craft and course that would demand a high caliber of golf. Sand bunkers and water are plentiful throughout the championship 18. Since the 1996 opening of the Course and Clubhouse, golfers have put their talent to the test and have appreciated the challenge of Cougar Creek. Each hole brings a unique characteristic to the course; the first eleven holes wind through the mature aspen, poplar, spruce, and birch trees, holes twelve through fifteen open up and have a links style play, holes sixteen and seventeen return into the trees and hole eighteen is open but water is in play. 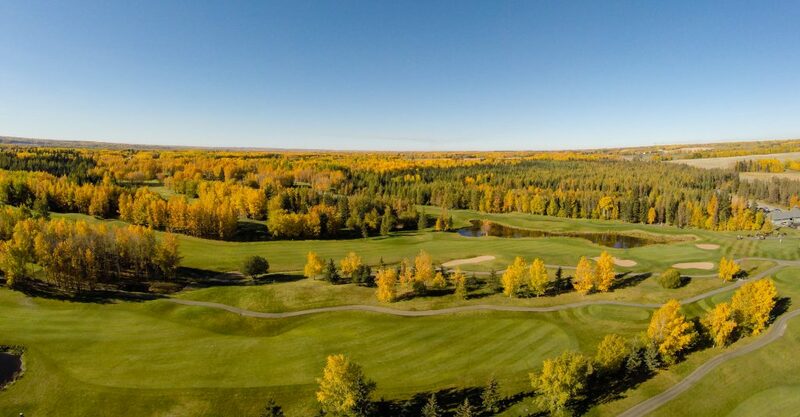 The Cougar Creek Golf Resort facility offers a unique golf outlook for all levels of players and has become known as “A Player’s Choice”. 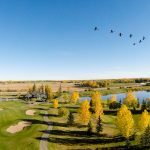 Its close proximity to Edmonton makes Cougar Creek a popular destination for golf vacations and golf packages near the city. Restaurant: In the early morning or throughout the day and evening, you can relax and allow us to serve you in our lounge or on our patio. Enjoy our menu, which has a variety of casual fare items from appetizers and snacks to light entrees at a reasonable price. 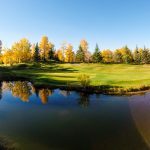 Banquets: Cougar Creek is a public facility intended for daily green fee play yet its location and facilities make it well suited for hosting tournaments/groups and corporate events. Our staff is available to help you plan and customize your private or corporate groups to provide a truly memorable experience. The scenic banquet room, which overlooks the lake on the eighteenth hole, is invitingly elegant and comfortable and will seat up to 200 guests. Your choice of plated menu service, buffet or barbecue is available. Tranquility. Beauty. Challenge. 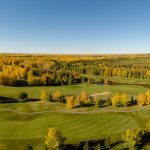 Those are the three main things people look for when they head out for a day of golf and that’s exactly what they’ll find, and more, at the Cougar Creek Golf Resort. 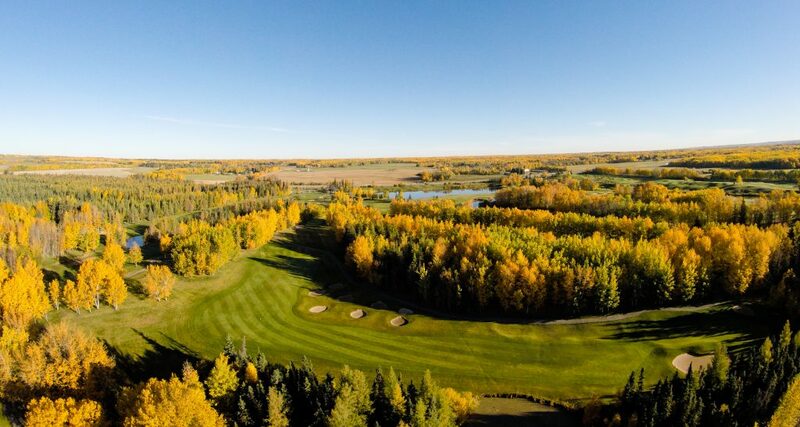 Located on the Yellowhead Highway west of Edmonton, Cougar Creek provides an exceptional golfing experience right from the first tee until the meal at the end of the day, said first year Head Professional Jake Behiels, who is entering his ninth year on the job at the track. Above all though, there is one major concern the staff at the facility have. 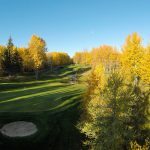 The neat thing about Cougar Creek is its unique design, where the front nine holes are treelined and feature shorter yardages while the back nine opens up and stretches out making golfers use every club in their bag more than once during a round. Tee box selection is critical here and while the blue tees may seem the ideal spot for some to play from on the front, the yardage differences between there and the back can swing a good card to “oh-oh” territory in a hurry. The third and fourth holes on the front nine are two great tests, the first a short par 3 and the second a long par 5. If you can stay out of the trees, or the water, which come into play on both, you know you’re off to a great start on what is a great golf course. Since most players like the time to warm up before they hit the links, Cougar Creek fits the bill to perfection here. There is a great practice area at the course from the aquatic driving range to a couple of different areas that allow players the chance for some pre-game short game work in order to get your swing in fine form prior to stepping onto the first tee box, with its narrow, tree-lined fairway. 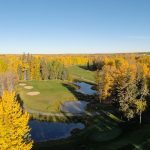 As with many golf courses these days, tournaments play a part of the yearly plan at Cougar Creek and with its setup it lends itself well to staging such events. But be assured, those big events don’t override the fact that this beauty also counts on the general public stopping in to have a few good whacks and a really good time. The thing is though, those tournaments still leave a lot of room on the tee sheet for the casual player who just wants to go out and test their skills on a course that is fun to play and always leaves you wanting to come back for more. 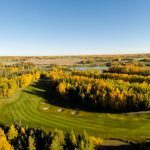 While there are a lot of golf courses in the greater-Edmonton area, Cougar Creek Golf Resort is one of those that stands out from the crowd because of a number of things, said Behiels in closing. Included on his list were the fact that to the staff you’re the focus of their attention from the moment you walk into the pro shop until the time you leave. To book an online tee time at Cougar Creek Golf Resort go to playgolfalberta.com and follow the links.